Sabudana kheer is another recipe which we can have during fasting days. It is an easy to prepare kheer. 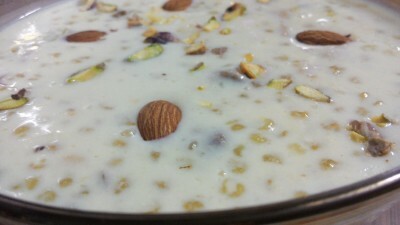 Soak and cook sabudana well and you will have rich, delicious, creamy kheer. So enjoy this yummmm…..sabudana kheer during fast. 1. Wash sabudana 2-3 times. Sprinkle some water over it and keep it for half an hour. After half an hour sprinkle more water over it and keep it for another half an hour. 2. In the meantime put milk in a heavy bottom pan and cook on low flame till milk thickens a little. Add saffron and cardamom powder also. 3. Add sabudana and let it cook with milk. Stir in between and cook till milk gets thickens and sabudana gets cooked. 4. Add chopped almonds and sugar and cook for 4-5 minutes. 5. Garnish with pistachios and serve hot or cold. I prefer chilled kheer . This entry was posted in Anupama Magic, Desserts, Fasting recipes, Festival recipes and tagged kheer, Sabudana. Bookmark the permalink.